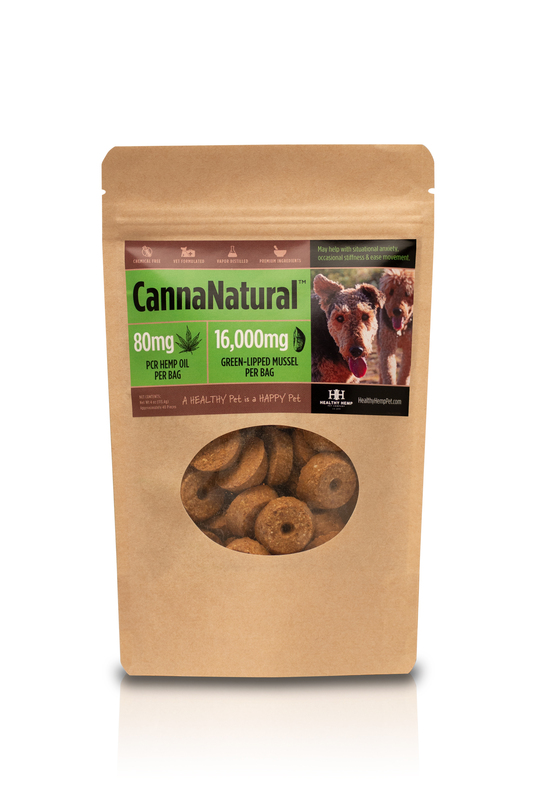 It’s the only hemp health product for companion animals guaranteed to contain 2 mg. of organic full-spectrum terpene rich PCR hemp oil in every single piece. 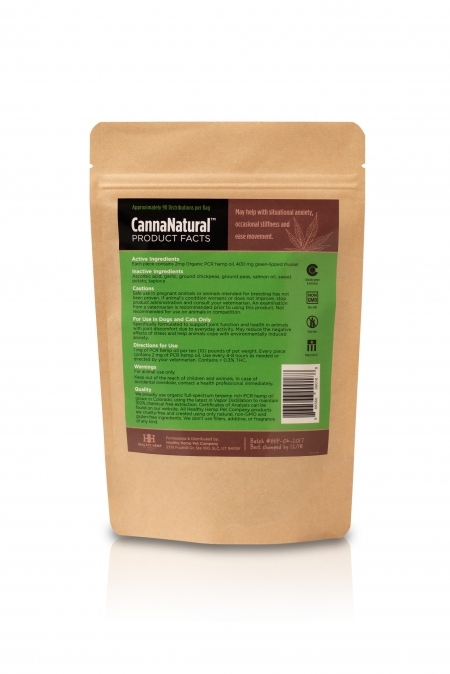 Note: Our 9 oz bags contain approximately 90 pieces and out 4 oz bags contain approximately 40 pieces. PCR Hemp Oil: 2 mg per piece. Our hemp oil partner’s proprietary extraction is the purest process currently available. 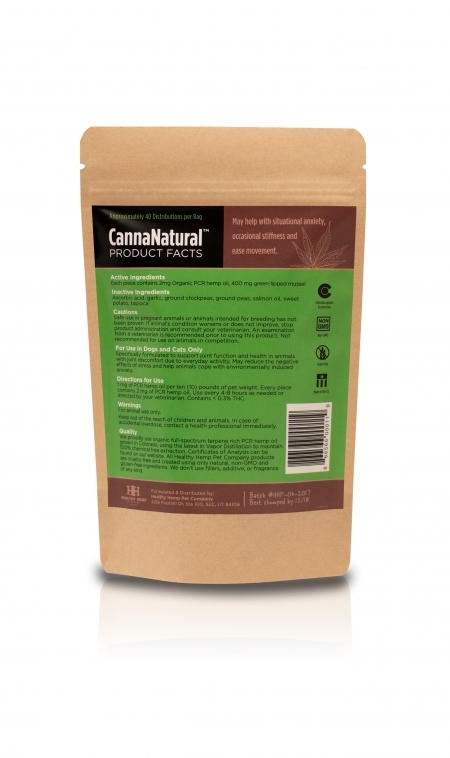 It delivers clean, 100% solvent-free, organic full-spectrum terpene rich PCR hemp oil from the flowers and leaves of naturally developed strains of industrial hemp grown organically and legally in Colorado under a Department of Agriculture program. Hemp oil also contains omega-3 fatty acids, which have shown benefit in supporting seasonal skin allergies, normal immune and neurological function, normal blood pressure and in enhancing brain function. Every batch of hemp oil we use has been tested and contains less than 0.3% THC. My dog Caesar is 19 years old and has had a rough time this past year. It got to the point that my wife and I didn’t know if we needed to put him down. Healthy Hemp Biscuits have literally turn his life around. His energy level and appetite has gone through the roof since he has been munching on these biscuits. Thank you Healthy Hemp for giving our family member a new start, keep up the good work! SO glad to hear Caesar is feeling better, Chris! Thanks for letting us know and for spreading the word about our CannaBiscuit! My dog Baxter was having bad anxiety as the neighbors were setting off fireworks next door. A half an hour after giving him a couple of these treats he was snoring away! We also use them before going on a car ride on our sepalla because she gets car sick from anxiety, and all her symptoms go away when we do! It’s GREAT to hear Baxter is able to chill during the firework and car rides with Healthy Hemp CannaBiscuit! 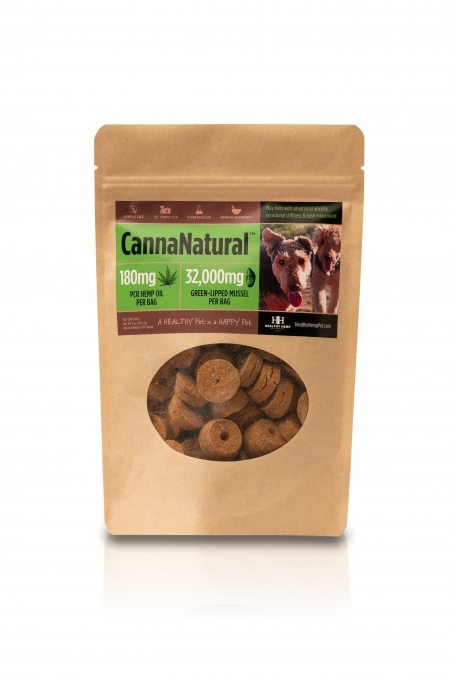 We’re seeing increasing acknowledgement of CBDs use as a calming agent from the Veterinary community too. Thanks for sharing with us! Lucy has lived with deteriorating joints since two and at fifteen years old we have been considering whether she can make it much further. We tried her on the biscuits not expecting any miracles but hoping to augment her daily meds. She is showing improvement, able to move around better and we are seeing more tail wagging. I think her daily experience is better for this and I wonder how she might have fared if we had this medicine ten years ago. Thanks so much for sharing Lucy’s story and her improvement, Kevin. The stories make a hard day’s work worthwhile for us! We share your wonder had we ALL had access to CBD years ago. I have seen some great improvement using cbd for my 12yr old Akbash. He wouldn’t eat anything, not even raw food. This was way more than just being picky. Even the vet was worried. After about a week and a half, he was back to eating dry food again, which he hasn’t done in over a year. I am so grateful. Dave, the owner of Healthy Hemp, is also an awesome person. I originally called him to see where I could buy his products for my other dog, and he called back a month later to see how my boy was doing. He really cares about helping our pets and enhancing their quality of life. Thank you! We’re grateful to you for giving us a try and sharing your experience, Lori. It makes our hearts sing to hear that Akbash is eating again! Keep us posted. I have a 15 year old retired sled dog, Rio that is a real sweet boy that was having declining mobility issues with his hind end. I have been feeding him 2 Healthy Hemp Biscuits 2x a day with great results! Now, his mobility is improved greatly and even running around! So happy to see him doing much better! 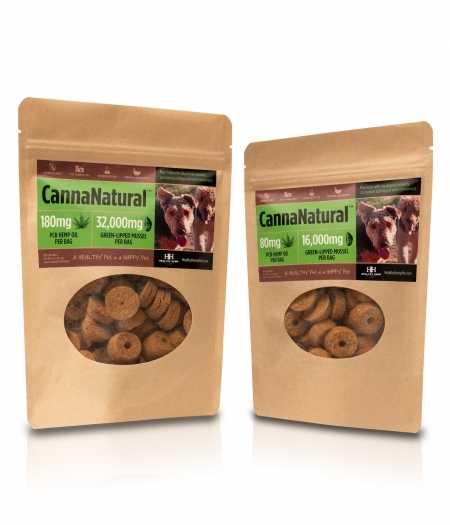 My dogs love the Healthy Hemp Biscuits! My 12 yr old Rottie is doing better after just one bag. She is getting in and out of the car better, is more playful and active, and just seems to feel better in general. Pops is my 7 year old hound/pointer cross who is a racing sled and skijor dog. He is fast and athletic, but in 2015 we noticed very dry skin and lesions on his belly/groin area and very inflamed gums. We started feeding him 3-4 CannaBiscuits twice a day in July this year and kept that regimen up for 2 months and now we give him 2 biscuits twice a day. We also use the HH CannaSpray on his gums. The redness of his gums is significantly reduced, the lesions are no longer reddish, and his skin is much less flaky. Also, his coat has a healthy shine and his energy level is consistently great when he does training runs. He loves the flavor of the biscuits and eagerly takes them. We’ve had our 9 year old Labradoodle on the biscuits for about a year. After 2 stem cell treatments on her hips, she still was not getting around that well. She also has pain in her spine and elbows. She has gone from lying around, then gimping around when she gets up, to a playful, happy dog again. We were at our wits end about what to do for her (we begrudgingly even tried narcotic pain meds for her, which didn’t work either) and can’t thank you enough for this great product!!! Our Shih Tzu is turning 15 this year and was beginning to show the wear & tear of age. He’s been on Dasuquin for some time, but the stiffness, shaking back legs and limping seemed to be accelerating. We started him on two Natural Canna biscuits daily and the improvement was dramatic in less than a week’s time. He’s moving with much greater ease, limping less and even his energy level is better. I can’t recommend highly enough. Love love love! As soon as I see that my dog is having troubles jumping in our car or on the bed, I give her a few of these a day and she will be able to jump up in no time. She seems so much happier that the joint pain is down.